CLICK HERE to view most sessions from WCN 2019 on the ISN Academy, including the exclusive Late Breaking Clinical Trials live session. This was the first time that an international nephrology society streamed a session to the world for free, with the aim to share knowledge with the global nephrology community. The second ISN Frontiers Meeting will take place in Gothenburg, Sweden from October 3 to 6, 2019 It will cover the topic Cardio-Pulmono-Renal (CPR) interactions and their interdependence in disease. ISN relies on its members to support the Society’s global outreach activities, which greatly influence kidney disease diagnosis and treatment worldwide. In return ISN provides valuable member benefits. 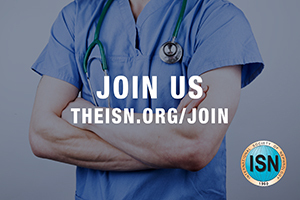 If you are not yet an ISN member, join us in our mission of advancing kidney care around the world. To become a member go to www.theisn.org/join.